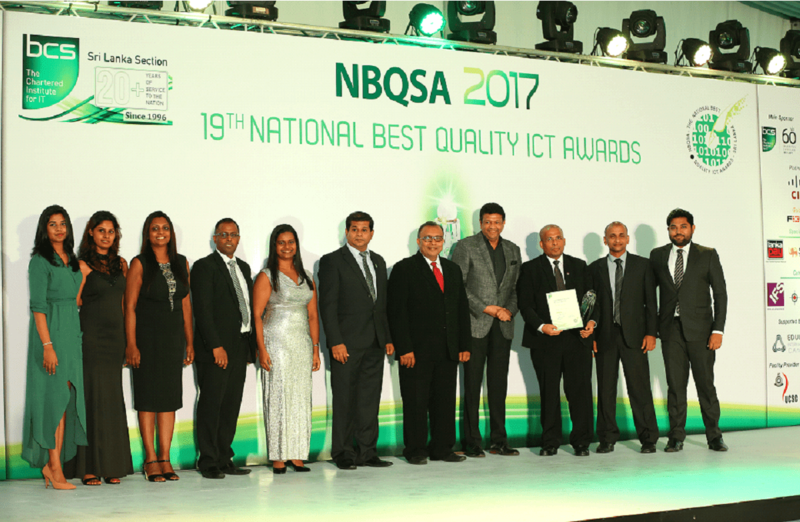 Colombo, October 19, 2017 Evinta Departure Control System (Evinta DCS), a product by John Keells IT, won the overall GOLD award at the recently concluded British Computer Society’s National Best Quality Software Awards (NBQSA) 2017, held at Taj Samudra, Colombo. Evinta DCS won the top award contending with more than 200+ leading IT companies in Sri Lanka. Evinta DCS was also adjudged as the winner of Gold award in the Travel and Tourism category and earned a nomination for the regional Asia Pacific ICT Awards (APICTA), which would be held in Bangladesh in Dec 2017, by virtue of being adjudged the winner of the Overall Gold Award at the finale. Mr. Paul Martynenko, the President of British Computer Society presented the award to John Keells IT team. ‘’Evinta DCS currently serves clientele across the global aviation spectrum. Almost 20+ years of experience has gone into engineering this to date and we continue to invest on it to make it relevant in today’s digital era. We are delighted to be recognized at NBQSA 2017 with an overall Gold award as well as Gold category award which bears adequate testimony of the efforts that have gone into the product in making it world class. We are committed to investing on it in making it one of our flagship products in digitizing airports and travel industry and making the experience for everyone concerned a seamless and an enjoyable one”, said Mr. Ramesh Shanmuganathan, Executive Vice President / Chief Executive Officer, John Keells IT. Evinta DCS is a fully Cloud based airport system that allows an airline to seamlessly check-in and board passengers through counters, kiosks, tabs and many other options. The system requires only an Internet connection to be accessible airport-wide and this sets it apart from other legacy airport systems that require expensive servers and communication links. Evinta DCS eases congestion at check-in counters and boarding gates while requiring minimal infrastructure. Evinta DCS’ graphical user interface is popular with airport staff who previously had to master a special set of commands to operate other traditional departure control systems. The NBQSA Award is the most sought after title in the IT industry and is conducted by the British Computer Society in association with SLASSCOM and ICTA, Sri Lanka.